Summary: When Madeline, Avery, Nicole, and Kyra came together in a time of desperation, they never expected that they’d end up integral parts of one another’s lives—let alone join forces on their own television show. But here they are bringing once-grand historic houses on Miami’s South Beach back to their former glory in front of a national audience. Having their work broadcast is one thing, but the women are unprepared when their personal lives start playing out on TV. As Avery struggles with a long-distance relationship, Nikki has to come to terms with the fact that she’s outgrown South Beach nightlife. And Maddie struggles to hold the whole project—and her marriage—together. Believe it or not, I have never read a book by Wendy Wax. I have heard so many terrific things about her books that I figured I was long past due, and I decided to start with her latest OCEAN BEACH. The description of this novel made it sound like an ideal pick for the summer; and while the story does take place at a beach, I decided not to wait until my chore vacation to read it. I figured poolside was close enough! OCEAN BEACH picks up where Ms. Wax's last novel TEN BEACH ROAD left off. Madeline, Avery, Nicole and Kyra come back together to work on a fixer upper house, but this time it's in Miami's South Beach. While they were aware that their work on the house would be broadcast to a national audience, they had no idea that every aspect of their lives would be filmed. In addition to trying to quickly fix up a house that has seen its better days (with a very limited budget, of course), each woman is also dealing with her own set of personal issues. These women must depend on each other's talents to repair the house, but they also find that they need the strength of these friendships to put their lives back in order. I'm just going to put this out there, but I didn't love OCEAN BEACH like I had hoped (although I'm sure I'm in the minority on this one based on some reviews that I've seen.) I think a major reason why I had issues with this novel is because I didn't read the first book in the series TEN BEACH ROAD. While OCEAN BEACH does work as a stand-alone, I'm not entirely sure it's the best way to read this book. I just didn't feel all that much for the characters; and in a novel like OCEAN BEACH, I think those feelings are essential to whether I will appreciate a book or not. I know Ms. Wax has some major fans out there (especially in the blogosphere) and I was really excited to read this novel. However, I had a particularly hard time getting into the story, and I even had a problems keeping the women and their background stories straight. For much of the novel, I felt as if I were a latecomer to the party; and I could only assume that much of the character development took place in the last book. Maybe I was just expecting too much from this novel, but I can honestly say that I was a little disappointed. Much of the story seemed silly to me, and I felt as if a few of the characters and their actions were classic stereotypes. Furthermore, there were quite a few scenes that seemed as if they were written for a movie script rather than a novel. I don't want to give away any spoilers, but some of the appearances of Kyra's ex-boyfriend (and those of his current girlfriend) just didn't work for me at all. Having said all of this, there were some positive aspects to OCEAN BEACH. I liked that there was a bit of a mystery element to the story, and I was anxious to see how everything would play out. In addition, I appreciated that there was some humor infused into the story. There really were quite a few times that I found myself laughing at the condition of the house or its occupants. And finally, I liked many of the overall messages of the story. I am a huge sucker for books that celebrate the strength of female friendships, and OCEAN BEACH certainly did that. Overall, OCEAN BEACH wasn't my favorite beach book this summer, but I blame myself for much of that. I sincerely wish I had started with the widely popular TEN BEACH ROAD so I could have gotten to know these women and appreciate their individual personalities and life stories. Thanks for the honest review. It,s good to know that I should pick up the first book and read it if I plan to read this one. 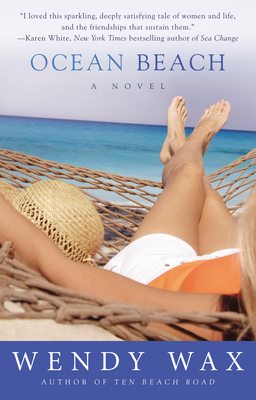 I just read this book too and, just like you, thought I would have enjoyed it more had I read Ten Beach Road first. I really have to agree that you have to read Ten Beach Road first. I do think this works as a standalone, but I think the experience is richer when you read the first book. A friend from my book club actually borrowed this one without having read Ten Beach Road and she said that she really enjoyed it. This is why I love blog reviews. I picked up this book, but will not read it until after I pick up and read Ten Beach Road. Thank you for your review.